Retail Store - installs pools, spas and fireplaces. Since 1952 California Pools has been the leader in the industry by building award winning swimming pools and providing the best unparalleled customer service. We are proud to be building swimming pools in the Green Bay and surrounding communities. Meet Shawn Schoen, the Green Bay manager: I have lived in Wisconsin for 21 years. My father was in the military (army). I was born in Ft. Hood Texas and lived in Germany, Colorado, Pennsylvania, Hawaii, and Indiana. We relocated back to Wisconsin after my father served 20 years and retired from the army. I believe what makes me different then other pool builders in Wisconsin is that I truly want to design and give my customers the pool or outdoor oasis they envision. I believe in developing a one on one relationship with them and have them trust in me as if I were part of their family. My approach to customer service is as simple as it sounds...Put them first mentality. They are investing a lot of trust in you as their builder. They expect the best and it is my job to give them the best. It is the key to a successful company. The customers are what builds the company not the pools. A family owned and operated business dedicated to serving Southeastern Wisconsin since 1964. We are located in Menomonee Falls and strive to build long lasting relationships with our customers. Starting with the first visit to our facility, through the purchase, and into problem-solving, service and consultations. We go the extra mile to gain and retain our customers. Both Don and Annette hail from the Milwaukee area, although they met in West Bend. Don has been in the pool business since 1970. Don began by building in-ground pools for Banner Pools, and is one of the oldest installers of in-ground pools left in the state. Annette, an MSOE graduate, was an industrial engineer for Amity Leather when they met. They opened Tropical Pool & Spa as partners in March 1986 and were married in January of 1988.Don and Annette’s first location was at the new Pick ‘n’ Save north site. During their stay there, they had to move once as they grew. As they became more successful, they looked to grow the business by adding patio furniture. They built their own shopping center and moved in the July 4th weekend, of 2000. Over the last 13 years, Tropical Pool & Spa’s 6,000 Sq Ft Show Room has grown to be the largest pool and patio store in Washington County. Tropical Pool & Spa’s motto “Relax In Comfort”, and what a better way then in your own backyard with Family and Friends.Let us help you create an outdoor oasis that will bring your priceless treasured memories. Whether it be with an above ground pool, sauna, spa or “American Made” furniture. We can accent with a fire pit, hammock, outdoor lighting and more, around your pool, patio, deck or sun room. Over the past 27 years, we have been working hard to bring the best quality products and service to our customers. What exactly do Gibbsville pool builders do? If you are planning for a new pool in Gibbsville, WI, a swimming pool builder will analyze your outdoor space and your aesthetic wishes to determine an appropriate design for your yard, installing it once the plan is developed and approved. Once installed, some pool companies in Gibbsville, WI can handle the necessary cleanings, water testing, renovations and equipment replacement or repairs for your pool or spa. If not, many can also suggest Gibbsville, WI swimming pool contractors or maintenance services to help with upkeep or repairs down the road. Here are some related professionals and vendors to complement the work of swimming pool builders: Garden & Landscape Supplies, Landscape Architects & Landscape Designers, General Contractors, Landscape Contractors, Solar Energy Contractors. Before hiring a swimming pool construction company to create your new Gibbsville, WI pool, determine how you'll be using it. Will it be for fun or for lap exercise? Will the primary users be children, adults or a mix of the two? Knowing the use can help you find Gibbsville pool builders who shares your aesthetic. Once you find swimming pool builders in Gibbsville, WI who share your style, research is critical. Review customer references and comments, collect at least three to four estimates to compare, meet with potential Gibbsville pool designers and builders in person and ensure that they are Wisconsin certified service professionals and licensed with the registrar of contractors before making any final decisions. In addition, get a sense whether they plan to complete the pool installation and be done with it, or whether they seem interested in building a long-term relationship with you. Be wary of the former: it's likely a reflection on the level of quality of the pool construction they do. 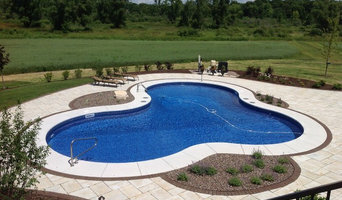 Find a Gibbsville pool contractor or designer on Houzz. Narrow your search in the Professionals section of the website to pool builders in Gibbsville, WI. You can also look through Gibbsville, WI photos by style to find a pool or spa you like, then contact the local pool company who designed it.